It is heartbreaking when a much-loved cat goes missing so we would like to appeal to people who are feeding ‘strays’ to take them to a vet to check if they are microchipped. 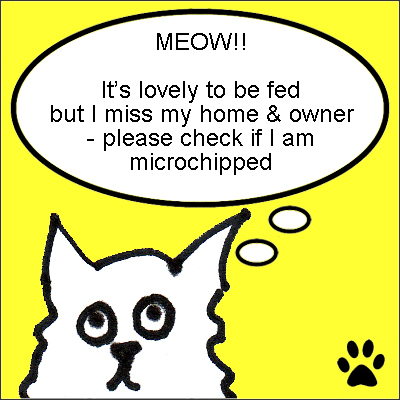 There is no charge for this service & if the cat is microchipped it can be reunited with its owner. Sue is looking for someone to take on the role of checking and cleaning toys that are handed in to us. We will provide any batteries needed for electronic toys. We are grateful for donations of toys but please do not donate them if they are broken or there are missing pieces as we cannot sell them and it means that Sue has to waste precious time & diesel taking them to the tip. Sue has to visit Ladybank tip at least twice a week with unsellable items – we are receiving more unsellable items now than ever before, maybe because the council will not empty overloaded bins. Thanks go to Newburgh Ladies Social for their donation of bric-a-brac.